This has been such a nice weekend. We’ve finally had a couple days that actually feel like spring, and it’s amazing what a day or two of sunshine does for your mood. I celebrated with a pedicure The forecast is looking good for Monday, so I may even get to show it off. I’ve had a bit of an up and down reading week, but landed in such an unexpected, amazing place, that I can hardly wait to share it! 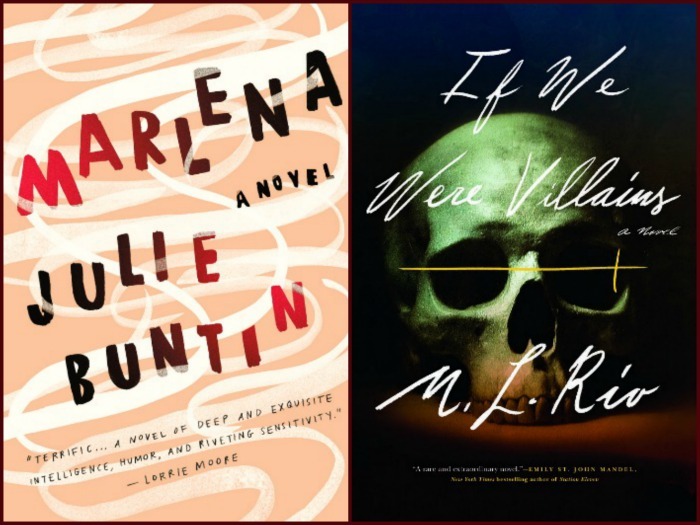 I’ve been on a pretty good role with books and Marlena by Julie Buntin was no exception. I thoroughly enjoyed this gritty coming-of-age story about two girls, one wild and experienced, the other vulnerable and ripe for change. Told with the distance and compassion of twenty years later, this debut may be one of the best for 2017. (Review later this week.) After Marlena, I started The Shadow Lands by Elizabeth Kostova. I was struggling with it right from the start, but kept going, constantly considering if it was time to quit. Then on Tuesday I saw a post from Shannon @rivercityreading about books to look for this spring. On it was a book I hadn’t heard of, If We Were Villains by M.L. Rio. I was intrigued with her blurb and immediately went to NetGalley and requested a copy. I got it the next day and after 10 pages, knew I wouldn’t go back to The Shadow Lands. There is so, so much I want to say about If We Were Villains, but will save most of it for my review. (Coming next week.) Today, I’m going to leave it at, “FINALLY, FINALLY FINALLY a book that lives up to its hype!” If We Were Villains is being compared to The Secret History by Donna Tartt, a book loved by many including me. Guess what? Villains IS very much in the same vein as The Secret History, yet stands well on its own merits. I think Rio’s debut is amazing! 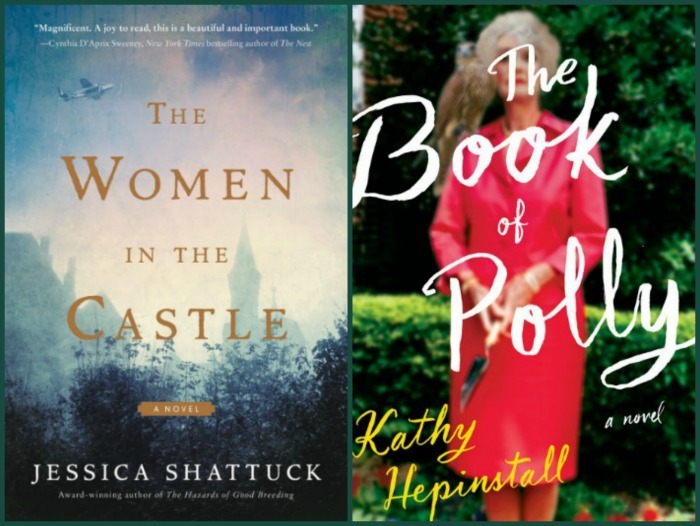 I wasn’t sure I was really up for an historical fiction, but quickly changed my mind with Jessica Shattuck’s The Women in the Castle. I’m at about 20% and really enjoying the story of three German women before, during and after WWII. I’ve been listening to The Book of Polly by Kathy Hepinstall for the last week and it has made my drives so pleasant. Polly, a cantankerous southern woman, found herself a pregnant widow at 58. That child, Willow, narrates Polly’s story which is also her own. The book is laugh-out-loud funny with some serious undertones. Who knows really? I’m not actually sure what I’ll read next. I’d like it to be The Stars Are Fire by Anita Shreve or Underground Fugue by Margot Singer, but neither is out until the 18th. I may need to find something else in the meantime. 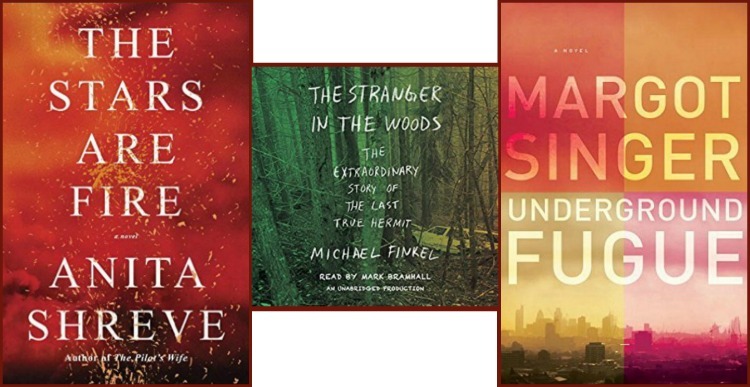 My next audio book will definitely be The Stranger in the Woods, a nonfiction, which has come highly recommended by Sarah @sarahsbookshelves and many others. Any suggestions for what to read next would be most welcome! Disclaimer: There are Amazon Affiliate links contained in this post. So glad you’re going to try Stranger in the Woods! So – I read about 25% of Marlena and just couldn’t really get into it. What is wrong me with?! You and Tara both liked it. I think I’m headed towards a slump or at least some floundering around. Then, I downloaded Book of Polly and am about 30 pages into that. Like it so far…love the badass grannies who just don’t care anymore. Also just requested We Were Villains….Secret History and Black Chalk comp got me! At first I didn’t think I was going to like Marlena either, but the further I got in it the more I liked it.Hopefully that slump isn’t going to happen. I’m so excited to hear what someone else thinks of Villains! These books are all new to me. I love seeing love for books of all genres. Come see my week here. Happy reading! I agree! A little bit of warmth and sunshine is going a long way in my house. I’m currently reading Fates and Furies…and I’m thinking about quitting it. It had me at the beginning, but I’ve lost interest since (I’m halfway through). Should I hold on? I liked Mathilde’s part of the story better than Lotto’s and that’s the second half of the book. I liked Fates and Furies despite the fact that I didn’t really care for either of the main characters. Still, if you’re not enjoying a book, my advice usually is to give up. There are too many great books to waste time on ones you’re not enjoying. I’m adding If We Were Villains to my wishlist. It’s Monday, What Are you reading? Ok I’m so definitely adding If We Were Villains to my TBR stack. I looked at reading The Shadow Lands but then read the description and a very early review. I was terribly disappointed it didn’t sound like it would be very good. I look forward to your review of If We Were Villains! I loved The Stranger in the Woods and am happy you’re reading it. I am fascinated with Chris Knight’s abilities and felt for him and his predicament. I want to read Polly and have it on hold at the library. The library pretty much ensures I’ll get to it. Sometimes that little extra push is a very good thing. Both Marlena and If We Were Villains are going on my TBR list. Nice to hear your weather has improved. Ours has too…I hope it continues. So glad to hear you are enjoying THE WOMEN IN THE CASTLE. It is a worthwhile read. Have a wonderful week, and thanks for coming by my blog. I always enjoy visiting your blog. I need a little pick-me-up, Susie; I think I may look for The Book of Polly! Also, I’m super-excited for you to read The Stranger in the Woods! !